Leider ausverkauft und nicht mehr lieferbar ! Since the 1970s Mary Hunt Kahlenberg has been building her collection of exquisite ceremonial garments and sacred textiles from throughout Indonesia's chain of tropical islands. Dating from the past five centuries and brought together here for the first time in book form, these woven and batiked hangings, ceremonial mats, jackets, shawls, and head cloths form a stunning array that will draw the attention of anyone with a love of art, fine craftsmanship, and design. Large, elegantly presented photographs show the textiles in incredible closeup detail and full expanse, making it possible to appreciate their technical brilliance and rich colors as well as the dazzling assortment of intricate patterns and motifs. Including essays by leading anthropologists and art historians, this book brings readers into a world ruled by the belief that weavings communicate with and transform those who come into contact with them. RUTH BARNES is the Senior Curator in the Department of Indo-Pacific Art at Yale University Art Gallery. 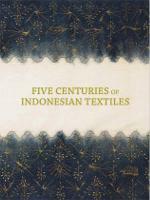 She has written extensively on Indonesian culture, textiles and related art forms. MARY HUNT KAHLENBERG is a world-renowned authority in the field of historic textiles. She was Curator, Costume and Textiles, Los Angeles County Museum of Art, where she built the Indonesian and Pre-Columbian collections. She is currently a co-owner with her husband, Robert T. Coffland, of TAI Gallery/Textile Arts in Santa Fe, New Mexico.